Lots of people apparently think it’s a big deal that Gartner is predicting Android will surpass iOS for second place. But why is that necessarily a good thing, given that they’re predicting Symbian will remain in first place? Who thinks Symbian is actually doing well? Nokia’s board sure doesn’t. via Daring Fireball Linked List: Gartner Predicts Mobile OS Market Share. I also noted with amusement that by 2014 “other” is slated to sell 85 million units or nearly 10% share, up from 6.1% in 2009. These “others” will be selling more than twice what Apple is expected to sell this year. Is “other” WebOS, Bada, MeeGo, LiMO? If so they’re in for a healthy future. But dwelling on details like these is missing the point. To see how improbable this prediction is, let’s go back to 2006 and ask what Gartner was forecasting would happen now. Gartner defines a PDA as a data-centric handheld computer weighing less than one pound that is primarily designed for use with both hands. These devices use an open market operating system supported by third-party applications that can be added into the device by end users. They offer instant on/off capability and synchronization of files with a PC. A PDA may offer WAN support for voice, but these are data-first, voice-second devices. In other words, in 2006 Gartner was splitting phones with operating systems into two separate markets: data-oriented wireless PDAs and voice-oriented smartphones. The split was mostly based on the judgement of the analyst on whether a device was “voice” or “data” oriented. I suppose they used the primary input method as a proxy: numeric keypads meant the device was one-handed and therefore voice-oriented. If the device had a full keyboard and/or a stylus-actuated touch screen then it was a two-handed data-oriented device. But even this proxy was not quite enough, sometimes devices were classified whimsically. The presence or absence of a cellular radio did not enter into their view of these devices. So if you asked Gartner in 2006 to forecast smartphones (as we know them now) in 2010, I suppose you’d get what they forecast for “data-centric” devices. So assuming that today’s smartphones are mostly “data-centric” we would have to look back on their view of that market and not the voice market which was seen as an entirely different thing. Their answer should have had something to do with the market leaders and participants in 2006. As the table above shows Gartner showed that RIM, Palm and HP led in 2005 with Nokia and T-Mobile pulling up the rear. Microsoft Windows CE was the No. 1 PDA operating system (OS) in 2005 as 7.05 million PDAs were loaded with the OS, up 33 percent from 2004 shipments of 5.28 million units. Palm OS PDA shipments declined 34 percent to 2.96 million units in 2005. 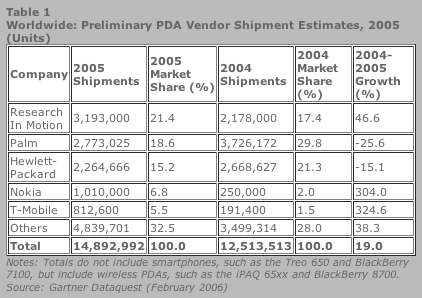 In 2006, Gartner expects the PDA market to increase by 6.3 percent to 16 million units. The market will continue to be driven by broader availability of cellular-enabled PDAs from wireless carriers. Gartner estimates that 53 percent of all PDAs shipped in the first half of 2006 featured integrated cellular capability, up from 46 percent during the same period in 2005. 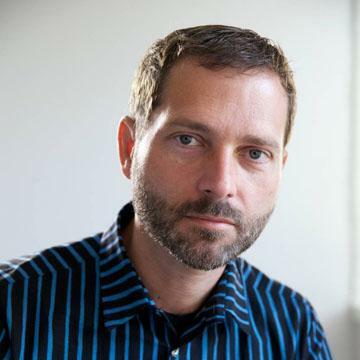 “The share of PDAs purchased by enterprises will continue to increase; it accounted for 49 percent of all PDA shipments in the second quarter of 2006 and Gartner expects that the enterprise market will account for 52 percent of all PDA shipments in 2006,” said Todd Kort. At this time I have not yet dug up a Gartner “Wireless PDA OS” four year forecast from the year 2006 but I suspect it would not show devices running Google’s Android operating system or any running something called iOS. I also seem to remember that they were suggesting that Windows would be the leading mobile platform. Although it was trailing in 2006, Gartner was quite bullish on the disruptive challenger from Redmond. T-mobile is in the list because it was common practice in 2006 for operators to market Pocket PC Phone Edition devices made by HTC under their own name. Orange, Vodafone and Verizon also had own-brand HTC Windows touch-based devices. Now what does that strategy remind me of?